Imo State Governor, Rochas Okorocha said that only his son-in-law, Uche Nwosu, can win Imo's 2019 governorship election in the state. 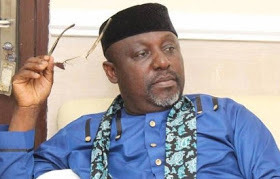 Okorocha spoke in Owerri, through his Chief Press Secretary, Sam Onwuemeodo, while reacting to the indefinite adjournment of the Imo APC governorship tussle between Uche Nwosu and Senator Hope Uzodimma. Okorocha said, "It is only Uche Nwosu who can win the imo for APC in 2019. We defeated an incumbent governor, Chief Ikedi Ohakim of PDP extraction in 2011. " He / she has been maintained in the state of the art, especially in the state of the arts. "The governor is urged members of the party in the state to remain united and continue to work hard for the party," Onwuemeodo stated.